Gloria Steinem and Kate Spade New York — in a fashionably generous partnership — have donated $40,000 to the Women’s Media Center after collaborating on an amusing episode for a Kate Spade New York mini-series. Steinem is featured in The Best Company, the third installment of Kate Spade New York’s #Missadventure mini-series featuring Pitch Perfect star Anna Kendrick. Steinem donated her fee to the Women’s Media Center, and Kate Spade New York matched it. In the three-minute holiday campaign ad, Steinem, who plays herself and wears a Kate Spade New York black leather trench coat, dines alone in The Russian Tea Room near a table occupied by Kendrick. Frustrated by a last-minute cancellation by her dinner date — Kendrick whimsically entertains herself with her small dog sitting in a travel bag plus a festive Santa-shaped purse. Curious about who is seated at her usual table, Kendrick later peers through the artificial bushes separating her booth from the adjoining one and discovers Steinem. “You’re like changing the world and I’m like worried about my table. Sorry. So sorry,” she says. In the end, they share Kendrick’s table and a decadent dessert. 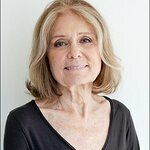 The ad includes two black-and-white minute-long interview videos: Gloria Steinem: On Being An Author — where she quotes bell hooks, “If you can buy shoes together, you can do politics together” and Essential Gloria, “It’s actually a civil right to dine alone,” Steinem says in the video. 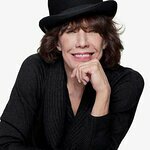 Lily Tomlin, who was host of 2013’s “Women’s Media Awards” starred in a previous episode of the #Missadventures series. The Women’s Media Center, co-founded by Jane Fonda, Robin Morgan, and Gloria Steinem, works to make women visible and powerful in media.